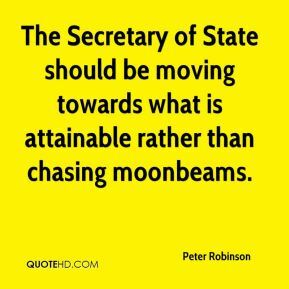 The Secretary of State should be moving towards what is attainable rather than chasing moonbeams. 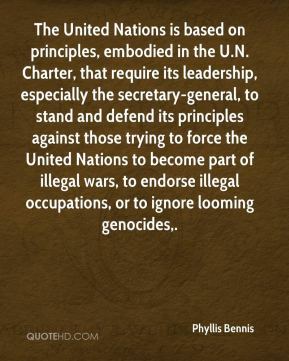 The United Nations is based on principles, embodied in the U.N. Charter, that require its leadership, especially the secretary-general, to stand and defend its principles against those trying to force the United Nations to become part of illegal wars, to endorse illegal occupations, or to ignore looming genocides. 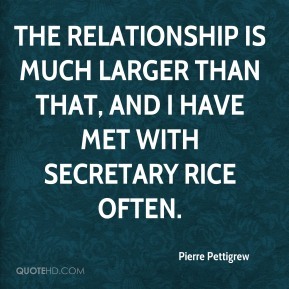 The relationship is much larger than that, and I have met with Secretary Rice often. 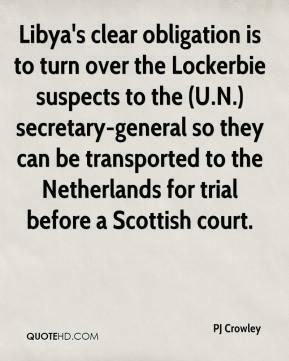 Libya's clear obligation is to turn over the Lockerbie suspects to the (U.N.) secretary-general so they can be transported to the Netherlands for trial before a Scottish court. 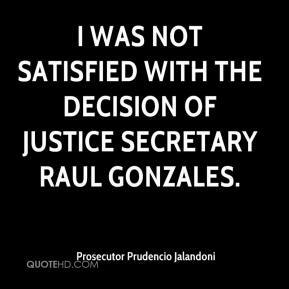 I was not satisfied with the decision of Justice Secretary Raul Gonzales. Secretary Powell will return to the region on another trip once the newly confirmed Palestinian Cabinet has had the opportunity to begin its work. 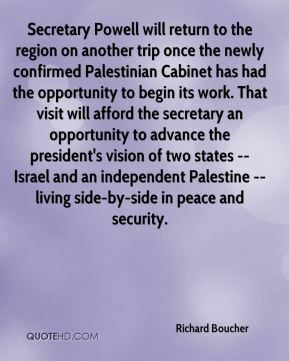 That visit will afford the secretary an opportunity to advance the president's vision of two states -- Israel and an independent Palestine -- living side-by-side in peace and security. There's nothing anybody can find in the Election Code. 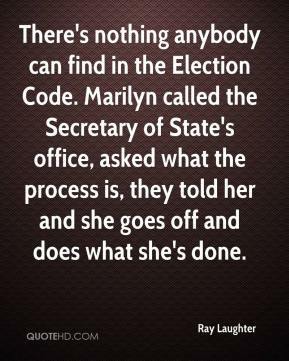 Marilyn called the Secretary of State's office, asked what the process is, they told her and she goes off and does what she's done. 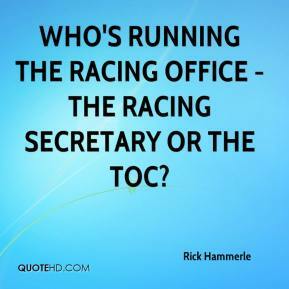 Who's running the racing office - the racing secretary or the TOC? 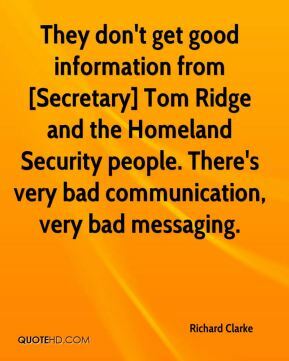 They don't get good information from [Secretary] Tom Ridge and the Homeland Security people. There's very bad communication, very bad messaging. 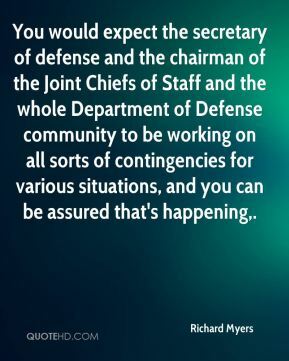 You would expect the secretary of defense and the chairman of the Joint Chiefs of Staff and the whole Department of Defense community to be working on all sorts of contingencies for various situations, and you can be assured that's happening. 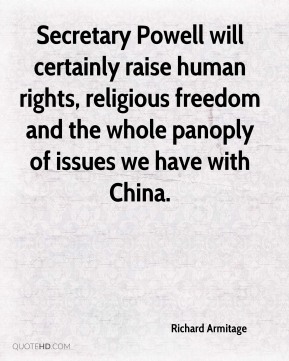 Secretary Powell will certainly raise human rights, religious freedom and the whole panoply of issues we have with China. I'm not going to comment on rumors and speculation. 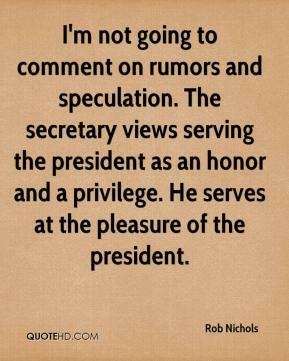 The secretary views serving the president as an honor and a privilege. He serves at the pleasure of the president. 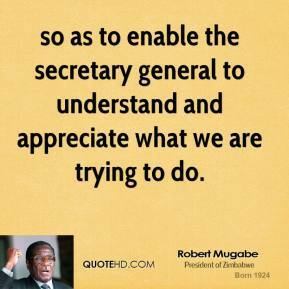 so as to enable the secretary general to understand and appreciate what we are trying to do. 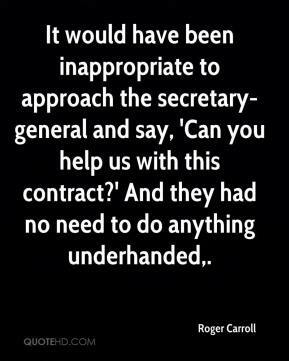 It would have been inappropriate to approach the secretary-general and say, 'Can you help us with this contract?' And they had no need to do anything underhanded. 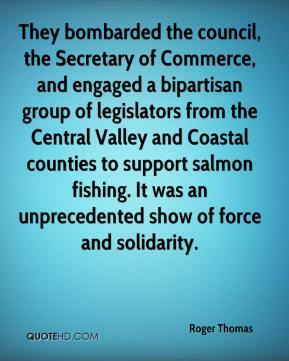 They bombarded the council, the Secretary of Commerce, and engaged a bipartisan group of legislators from the Central Valley and Coastal counties to support salmon fishing. It was an unprecedented show of force and solidarity. 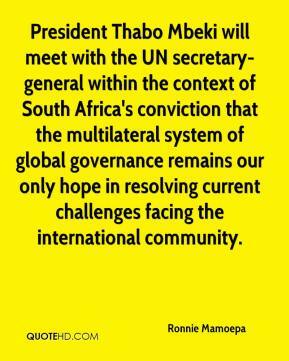 President Thabo Mbeki will meet with the UN secretary-general within the context of South Africa's conviction that the multilateral system of global governance remains our only hope in resolving current challenges facing the international community. The Gov. 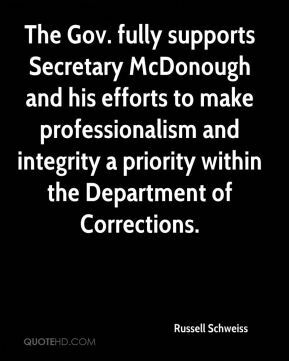 fully supports Secretary McDonough and his efforts to make professionalism and integrity a priority within the Department of Corrections. 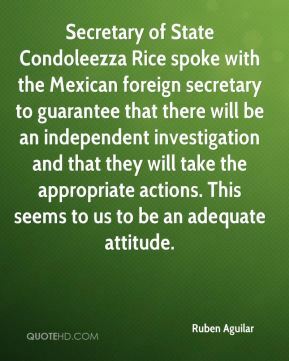 Secretary of State Condoleezza Rice spoke with the Mexican foreign secretary to guarantee that there will be an independent investigation and that they will take the appropriate actions. This seems to us to be an adequate attitude. 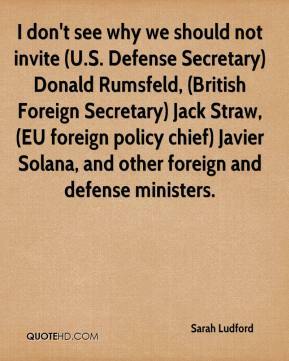 I don't see why we should not invite (U.S. Defense Secretary) Donald Rumsfeld, (British Foreign Secretary) Jack Straw, (EU foreign policy chief) Javier Solana, and other foreign and defense ministers. 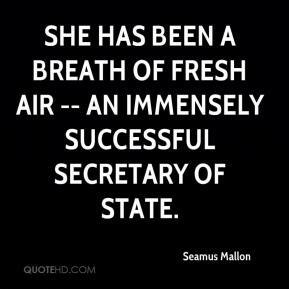 She has been a breath of fresh air -- an immensely successful Secretary of State. 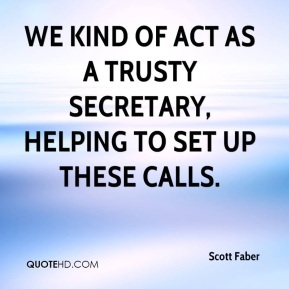 We kind of act as a trusty secretary, helping to set up these calls. We don't see switching the court as affecting the outcome for us. 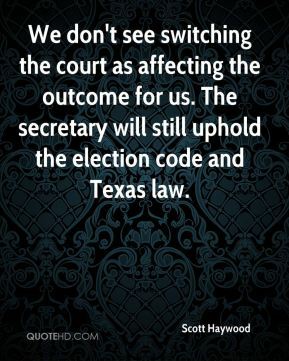 The secretary will still uphold the election code and Texas law. 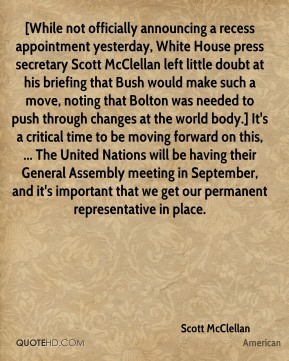 [While not officially announcing a recess appointment yesterday, White House press secretary Scott McClellan left little doubt at his briefing that Bush would make such a move, noting that Bolton was needed to push through changes at the world body.] It's a critical time to be moving forward on this, ... The United Nations will be having their General Assembly meeting in September, and it's important that we get our permanent representative in place. I play David Hasselhoff's secretary and she gets around a bit - it's quite a role. I end up in bed with Adam Sandler, It's so surreal it's hysterical ... I'm so excited. This is the biggest thing I have ever done, there's no comparison. 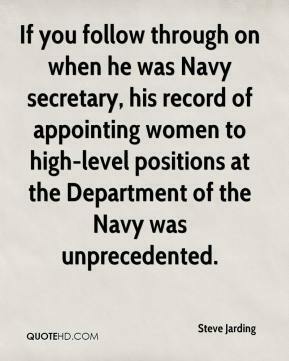 If you follow through on when he was Navy secretary, his record of appointing women to high-level positions at the Department of the Navy was unprecedented.